Best pond management tips for fish farming business in Bangladesh. It’s necessary to select the site carefully to produce a good crop of fish every year. Also, you should construct the pond properly, maintain good water quality, and stock and harvest the pond correctly. These all are the part of pond management, which is much essential for your fish farming business in Bangladesh. The ability of the owner to obtain sound pond management advice and carry out the recommended practices is the difference between a productive pond and unproductive ponds. So, determine your objectives and priorities for the pond before constructing a pond. And it’s your objectives that you should make your best pond management strategy. Does it look like the very difficult thing to do for you, right? But, don’t worry because we’re here with the easy solutions to this issue. And you’ll be learning about the basic principles of managing recreational ponds. 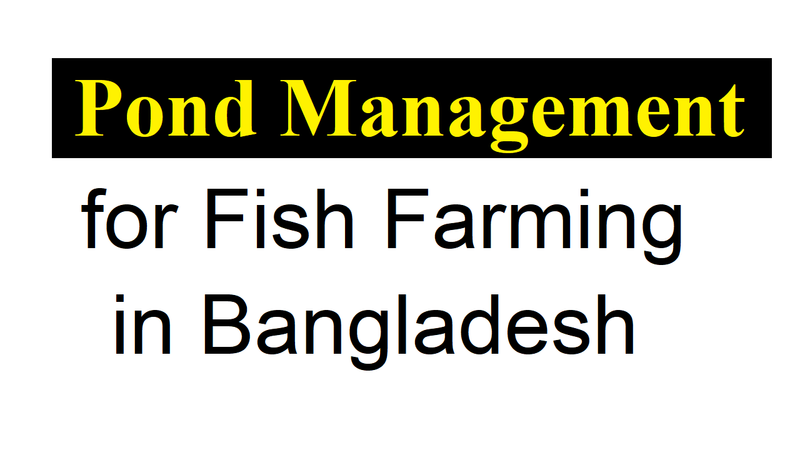 What is the Pond Management for Fish Farming in Bangladesh? We have to know what a pond is before discussing about pond management. Usually, a still water body is known as a pond, which is seen in almost all areas of Bangladesh. Although it’s mostly seen in the village area, some are also found in the city area. As the most ponds are used for fish cultivation, people use the pond for different purposes. And the most type of fishes both freshwater and saltwater is cultivated in the ponds. But, it depends on the pond ecosystem of the successful fish farming along with proper pond management. For the ponds, the source of water can be a river, lake or another natural way, such as rainwater and underground water. Besides, there are different water sources; it has to have the facilities of changing weekly or monthly though. And if it has the facilities of replacing after every two to three months it would be better. The pond water should change or replace for highest fish production when it would be lost from evaporation or seepage. But, it will reduce his production if the farmer changes the whole water of the pond more and more. As the pond can be different sized, it can be a small one or a pond of numerous hectares. Although small pond design is made for meeting up family animal protein supply or consumption, the larger pond is made for commercial purposes. So, you should keep in mind about the pond culture, pond design, pond management, and the pond supplies system before pond construction. Now, let’s know about the methods of pond management for fish farming in Bangladesh. Deciding where and how to build your pond is Perhaps the most important aspect of pond management. Also, if the pond is properly designed and constructed then you can avoid many problems. And you can obtain necessary technical guidance while contacting your nearest private or public aquaculture service provider. Finding the right place (selecting the site) for the pond is one of the most important parts of planning. Depending on your farming type you should select the size of the pond. For example, you can start with a small pond design if you want to cultivate fish to meet up your family needs. But, you have to make a large one if you want to cultivate fish commercially. As the pond can be both square and rectangular sized, they are easy to build. So, the best for family used fish pond is a pond with an area of 250-300 square meters. However, the pond size can be any for commercial purposes. But, keep in mind that the size of the pond should be right which is easy to maintain. If the water depth is 30% in one corner then it should be 100% in another corner. Depending on the species of fish you are cultivating the Depth of the water should decide. So, if you want to use it for reserving water for the dry season then the depth of the pond can be more. Although whatever the depth of the pond can be, it has to have the good facilities of draining. When there is a well-drained pond it’s suitable for collecting fish. Among the other pond management processes, pond constructing is the most difficult and expensive way of fish farming. Because it is a long deposit and a pond can be used for several years, a pond should construct well. In Bangladesh, the most fish ponds use water that comes from a stream, river, or lake. Because the water can be controlled easily, this is a good way to fill a pond. The channel can be blocked with a gate or a plug when the pond is full. But, you may find problems with this kind of water source. For example, in the rainy season, tropical areas streams to flood. As this extra water can be dangerous to the pond, they must be diverted away from the pond by a channel built for that purpose. So, when choosing a water supply and site for a pond, it’s best NOT to choose a place that is known to flood. This is because when a pond floods, all the fish escape. So, the farmer should plan to filter the water carefully when filling the pond if the water for the pond is being taken from a stream, lake, or river. As water from these sources sometimes contains unwanted fish or fish eggs, it’s essential to filter these fish or eggs, and other harmful animals, from entering the pond.